Surf Scoter covered in oil as a result of the 2007 San Francisco Bay oil spill. 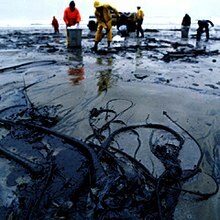 Oil penetrates into the structure of the plumage of birds and the fur of mammals, reducing its insulating ability, and making them more vulnerable to temperature fluctuations and much less buoyant in the water. There are three kinds of oil-consuming bacteria. Sulfate-reducing bacteria (SRB) and acid-producing bacteria are anaerobic, while general aerobic bacteria (GAB) are aerobic. These bacteria occur naturally and will act to remove oil from an ecosystem, and their biomass will tend to replace other populations in the food chain.